*HURRY* Peet's Coffee K-Cups (CRAZY DEALS) No Coupons Needed! Home Amazon *HURRY* Peet’s Coffee K-Cups (CRAZY DEALS) No Coupons Needed! We found a Peet’s Coffee deal on Amazon and no Peet’s coupons are needed! 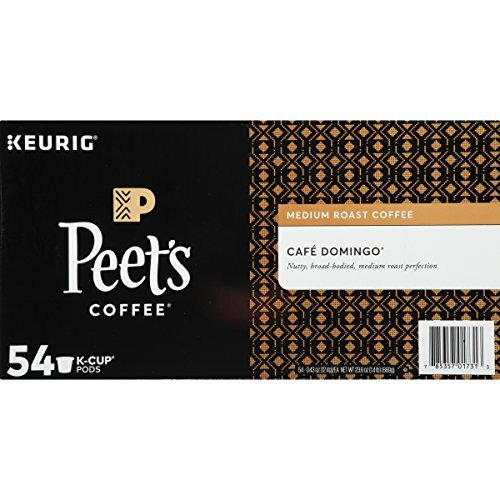 Hurry and get the Peet’s Coffee Café Domingo Medium Roast Coffee K-Cup Coffee Pods (54 Count) today for only $35.99 $15.61 from Amazon (HURRY)! That’s just $.29 per K-Cup (way less than our “stock up” price of $.40 each). Or choose, Peet’s Coffee Colombia Luminosa Light Roast Coffee K-Cup Coffee Pods (10 Count) for just $3.04 from Amazon! (HURRY) Check out all of the recent Amazon deals here! These are limited Warehouse deals (they will go quickly). There is currently no limit. These deals can be short dated or overstock. Amazon Prime members get FREE 2-day shipping!! If you are not a Prime member, get FREE shipping when you purchase $25 or more of eligible items across any product category. The three Latin American coffees in this carefully crafted blend were selected for their balance and brightness, and the roast fine-tuned to brew the perfect medium-bodied cup. We decided to name it after our third café, opened by Alfred Peet in 1980 on Domingo Avenue in Berkeley, in the shadow of the Claremont Hotel. For more than three decades, Peet’s regulars have gathered here to enjoy hand-crafted drinks and the camaraderie they inspire. And that’s something worth commemorating. Buy the Peet’s Coffee Café Domingo Medium Roast Coffee K-Cup Coffee Pods (54 Count) from Amazon.